About a year ago, Tununak opened a $19 million, state-of-the-art airport. But now, local airlines are refusing to fly there. The village’s shifting permafrost is buckling the runway, and both Ravn Alaska and Grant Aviation say that it’s too dangerous for pilots to land on it safely. According to Gordon Tester, Tununak’s school principal, the airport has been effectively shut down since last Thursday. Community members weren’t really told what was happening. 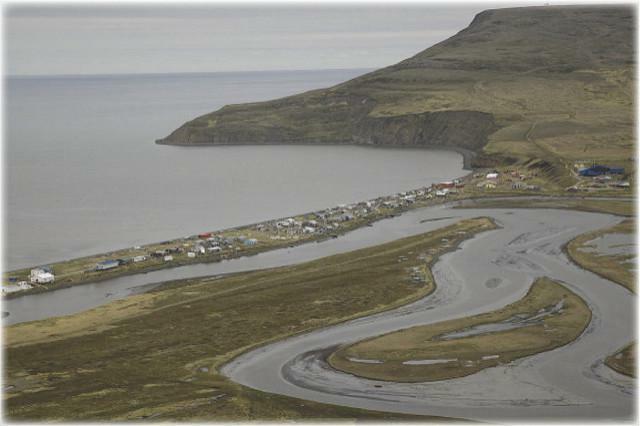 It was only then, said Tester, that Tununak residents discovered that Ravn and Grant had stopped flying to their village altogether. Like most Alaskan communities off the road system, Tununak relies on air travel for many goods and services. According to Tribal Administrator James James, several elderly residents are concerned about receiving their medications, some of which need to be refilled by mail. For now, community members are driving across the tundra on four wheelers to pick up their groceries and mail in Toksook Bay. Tester drove himself there the other day to pick up vegetables and an order of plastic lunch trays for the school. People have been joking about their bumpy flights in and out of Tununak for a while now, and Tribal Administrator James James said that he notified the Department of Transportation about the faulty runway earlier this year. The lower third of it is riddled with potholes, and now it’s starting to sink. According to Department of Transportation spokesperson Shannon McCarthy, the melting permafrost may be buckling under the airport’s weight. Tununak’s old airport didn’t have these sorts of problems, but McCarthy said that it still needed to be replaced. The old runway was built near the coast, and winter weather conditions made it difficult for planes to land there. As far as the new airport is concerned, McCarthy said that the Department of Transportation is sending one of its expert grader operators to Tununak with construction workers to assess the situation, but that their flights have been delayed by the autumn storms. Because their assessment has been delayed, McCarthy said that the Department of Transportation does not have a timetable yet for when Tununak’s runway will be fixed.